Stockpiling food and other supplies is the centerpiece of what’s known as the modern prepper movement. Anyone who has been building a food stockpile for a while runs into space problems. Unless you’ve got a room in the basement, which you can dedicate to storing food and other prepping supplies, the average American home just isn’t designed for the prepper. But there’s a much worse problem than that. That’s keeping your food stockpile. Should a crisis occur, where food is in shortage, every prepper is going to be at risk of losing their stash. Whether it’s desperate neighbors formed together as gangs or government agents bent on redistributing your wealth, you will be at a constant risk of losing your food. Of course, you can always defend your home, trying to fight off any attacking gangs or government agents. But there’s a limit to how far that can go. Eventually, they will bring enough people and enough firepower to take you out and take over your home. The other option is to hide your food. Then, if that gang of government agents makes it inside your home, there’s a chance that you won’t lose it all. Better than that, there’s a very real chance that you’ll be able to keep most of it. The question then becomes, where can you hid it? This list should give you some ideas. If your home is designed in such a way that you have a room at the end of a hallway or off another room, you can turn it into a hidden room. 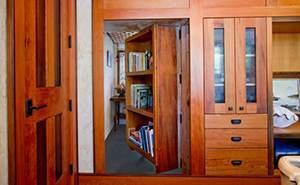 All you need to do is to build a bookcase, that is hinged like a door and opened by a hidden latch. Then, use that as your store-room, hiding your food there. Another, even easier way of creating a hidden room is to use the space under your staircase. This often has a closet built into part of it, but the rest of the space is wasted. Make a false back for your closet or a movable bookshelf alongside the stairs, and use the space inside as a stash. The interior walls of your home have 3-1/2″ of empty space in them. If you take the drywall off of one side, you’ll see the wall studs that make the structure of the wall, along with a few wires and some pipes. The rest is empty space. Simply build shelves between the studs and fill it up with non-perishable food. Then install new drywall, texture it and paint it to match your home. If your basement has a suspended ceiling in it you can turn the space above it into storage too. Removing the tiles will reveal the bottom side of the floor above, as well as the floor joists. Attach wood to the sides of the joists and store food on those shelves. Closets provide excellent places to hide things, other than the obvious idea of placing things in mismarked boxes. The space above the door is a great place to install a shelf. Even trained searchers forget to look up and see if there is a shelf there, and if there isn’t a light in the closet, there won’t be a shadow to give them a hint. You can also use the walls in a closet quite effectively; not the walls you see, but the wall that the door is in. Just like above the closet, nobody thinks to look at the back side of that wall. So, cut out the wallboard and finish the edges off nicely. Then install shelves between the studs, like we were talking about earlier. You don’t even need to cover these storage places back up with drywall, as nobody will likely look for them. If your kitchen has soffits above the wall cabinets, that’s dead space too. As with the walls, you can remove the drywall covering, exposing the structure and space within. Fill the space up and recover it with new drywall, texturing and painting it to match your kitchen. Or, you can make the job easier by covering it with wallpaper, eliminating the need for texturing and painting the drywall. Homes which use the attic as living space, possibly with the addition of dormers, will have unused space under the eaves of the home. All you need to do is build an access to get to this area and then floor it over to make a large, useful storage space. If you put the access in a closet or behind furniture, it will be much harder for them to find. A lot of furniture has empty space in it. Sofas and chairs often have a dust cover over the bottom, with several inches of empty space between it and the springs. This dust cover can be removed, food placed inside and a cover made of plywood used to hold it in, replacing the dust cover. Wood tables also have some dead space, directly below the tops, where the strips of wood run between the legs. These strips of wood are there to stiffen and support the table top, but also provide you with a few inches of dead space. As with the sofa, fill the space with food and attach a plywood cover, making sure that the cover won’t be visible from the sides. Another similar space is the box springs of your bed. Once upon a time, these were actually filled with springs, but with today’s mattresses most are just empty boxes. Like before, you can cover the bottom with plywood, making a storage space. However, you’ll probably need to reinforce the plywood quite a bit, due to the quantity of food that you can hide in there. Don’t forget your washer and dryer either. If you take the backs off of them, you’ll see that there’s a fair amount of space available inside, especially at the bottom. Just make sure that whatever you put inside doesn’t get in the way of the working mechanism. Bookshelves offer a fair amount of hidden space, if you do a little modification. The average bookshelf is 12 inches deep, while the average book is less than six. So, make a false back for your shelves, which will fit tightly between them. Then paint it to match the wall or look like it’s part of the bookshelf. Put the food inside, cover it with your false back and fill the front part of the shelf with books. It’s not really furniture, but there are a few inches of space underneath your kitchen and bathroom cabinets. The small area that’s set back is called a toe kick and it’s designed for your toes to go into, so that you don’t kick the cabinets. But there’s nothing behind there. If you pull the face board off (it’s probably glued and nailed in place) you can fill the area with food and then put the board back on. You can fake out searchers by using some fake stuff, specifically fake parts of your home. Few people know a home’s systems well enough to tell if things are fake or not. 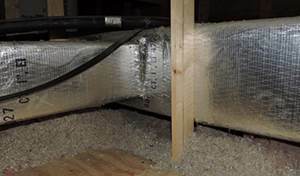 Take your heating ducts, for example. They’ll either be in your attic or basement, depending on the home’s design. Just add some more ductwork, making it out of the same material as the original and attaching it so that it looks like part of the home. You can fill it with food and nobody will be the wiser. 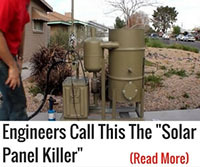 The same thing can be done in your basement, making extra plumbing pipes. You’ll notice that you have some four inch diameter plastic pipes, which are the drains from your toilets. Add another in another part of your basement, but don’t hook it up to anything. Just let it go into the ceiling and down to the floor. It will be just the right size to fill with canned goods. Speaking of attics and basements, yours is probably at least partially filled with boxes, like everyone else’s is. We tend to collect stuff in these places, whether it’s Aunt Gertrude’s linens or the kids baby clothes. So use those boxes as camouflage, filling them partway with food and then covering it with those old curtains and outgrown baby clothes. One of the oldest known ways of storing food was to bury it. Early on in American history, casks and barrels of food were buried in the ground, as a means of preserving it. For the most part, animals can’t get into food that’s buried in the ground, and raiding Indian bands didn’t know where to look for it. We can beat out those early Americans today, using five gallon food-grade buckets to store food in the ground. Insects can’t even get into those. You can also bury food in PVC pipe “safes.” A piece of 4″ PVC pipe, with caps on it, will fit nicely into a hole dug with a post hole digger. 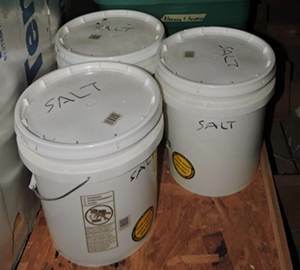 While they won’t hold as much as the five gallon buckets will, you’ll be surprised with how much you can get in one; especially if you do so without packaging. You should always keep some food off-site, just in case. Your home may burn down or you may be forced to abandon it. If that happens, the only food you may have is what you have stored elsewhere. So, where is elsewhere? To start with, check with friends and family members, to see if you can keep a stash at their place. If any of them are preppers as well, they’ll probably be more than willing. While there is a risk that they will use it in the case of an emergency, if they’re preppers, they probably won’t. Rent a storage space somewhere, or if you have one, make sure that part of your stockpile is there. A 10′ x 10′ storage space can hold a lot of food, along with your old golf clubs, the baby bed and the toys the kids no longer play with. Just make sure it’s conveniently located to your home, so that you can get to that food, even without a car. Create some buried caches too. These could be anywhere, but they are best done along your bug out route and near your planned bug out location. That way, they’ll be available to you if you are ever forced to get out of Dodge and abandon your home. No matter how well you hide your food, if they think you’ve got some, they’re going to keep looking. That is, they’ll keep looking until they think they’ve found it. So, you may as well use their thinking against them. Let them think they’ve found your stash and they’ll probably go away. What I mean is for you to set up a food stash for them to find. It should be easy enough to find, that they’ll think they’ll find it first, but not so obvious that they won’t think it was hidden. That way, they’ll hopefully take the bait, thinking they’ve found it all. But you’ll still have enough food to keep you going. Just make sure you act like they’ve got it all, so that they don’t keep looking. If you are felling thrifty you can buy a club chair and replace the springs with a hidden lock box and cover it with a cloth and then put a cushion on top. Also there are old secretary desks that have a hidden slip drawer that can only be accessed when reclined under the desk. 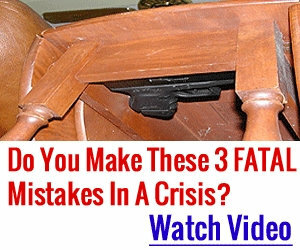 Usually you can find these items at the local flee market. I have something you need to watch. It’s much better than I am at explaining the threat. Watch it and learn why you need to hide your food stockpile source and how you can build your own hidden eco-system capable of producing food in any crisis. Another place to hide food: your lawn. Not buried, but actually part of it. Grains are after all a kind of grass, so until a couple weeks before they are ready to produce seed, they are virtually indistinguishable from regular lawn grass except to a very well-trained eye. Granted, it only “keeps” for one year, but if you harvest and replant, you only have to actually buy it the first year. And, it’s only available during a limited time during the year, but that is also the only time it can be taken from you, unless you are forced off your land. In “peacetime”, storage facilities like the one shown in the photo solve for lack of storage space in our homes, businesses, etc. But they should not be thought of as “impregnable”. 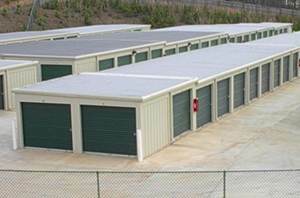 Even in “peacetime”, losses from storage units occur as the result of unauthorized or otherwise unlawful entry. In a “SHTF/WROL” scenario, eventually, determined, well-equipped individuals or gangs or hordes will likely roll over whatever perimeter security may exist, defeat the resident manager and whatever “forces” he may have, and then just take what they find. What’s to stop them…??? I’ve thought about hiding it in tree tops. Like in an old eagles next. if they have metal detectors they might can pick it up in the ground. treetops? what do they call the containers to store your supplies in and hoist in a tree to keep it away from the bears? sorry, i’m not a hunter, et al. camo it? One can also make use of the structural elements in the house such as the broken bricks can be used to provide texture and stability. part of both public and private decor today. Part of a stash can be hidden in the basement. Not YOUR basement, but THE basement. How many people wold expect a separate access in your garden shed ? Nice idea. And, for those that don’t Have a basement.. If you’ve got a Yard you Can dig a ‘pit’ in (careful to locate gas / water lines, etc..) You can bury 6 months of Food / Water / Gear in 5-6 ‘Pelican cases’ (1660s are a Great Size) they’re Impregnable, Watertight, Dust-tight, and al around just about bullet-proof. And ‘thick enough’ to likely discourage ‘metal detection’ of tins, etc. And, build a ‘false shed’ over top of your ‘pit’ (line with black plastic / sand as a moisture / freeze-barrier, and ‘lid’ the whole thing with pressure-treated 3/4″ ply – then mount the ‘false shed’ (something to Cover the hide, but not So Full of stuff, you’d not be able to move it / get at our stash, in a ‘bug out’ situ.. Just a thought..
As I stack my wood I put filled gas cans in the middle of the pile. Also, a 3″ PVC pipe will fit nicely in the cavities of a cement block and can serve as a fake support in the crawl space. Both procedures are fire proof from the main structure and easy to get to. Chuckster, I like the way you think! Clever, clever. You can get in trouble storing food in a rental storage place like the one pictured. I have a locker in a place that looks just like that one, and the agreement I signed says (among other things) that no food is to be stored there. The reason they gave is fear of infestation of the entire complex by insects, rats or other vermin caused by just one unit with food stored in it. It might seem fine to store cans within a plastic storage crate, figuring nobody will ever know and that no vermin will be able to open them, but you just never know. Earlier this year, I got a call from the management saying that the renter of the unit next to mine on one side had accused me of being the source of noxious slime that came over into his unit. I was 400 miles away, so I gave them permission to bust the lock and show the dude that this was not the case. Of course, that is what they found, and they then gave me a new lock free of charge. But I’m glad they didn’t see anything contraband, or of interest to them for other reasons in case the SHTF and they remember what they saw. So what do I keep there? Mostly, business records and materials sufficient to restart my business as seamlessly as possible after SHTF and then order being restored. I also keep startup materials for the business I intend to pursue in retirement, if I live that long and the S doesn’t HTF first. Other: A good winter coat, in case I have been forced out of my home for any reason in warm weather, and then the season changes and I need it but don’t feel like paying a lot for one. I got the one that’s there at 80% off in March. Not there yet, but planned to add: some basic tools in case something happens to my bug-out tool box, which by the way has a heavy latch holding it closed, and a flat top making it possible to use as a piece of furniture wherever I end up going. Having a storage locker has an added benefit even if nothing major disrupts things in my lifetime, which is that it enables me to live in a smaller house, with lower taxes and utility bills. I estimate that if I had to repatriate everything that’s in that locker, it would require two more rooms in my house. Not having them is well worth what I pay in rent for the unit. I would consider using my cleanout for the fireplace which is in my basement. It’s concealed by a pantry closet I placed in front of it and also a panel. There is a lot of room in there. Maybe place a grabber and a light just inside at the entry also. Consider your garage. Keep one area purposely messy and store behind it. People will think it’s just junk and trash.